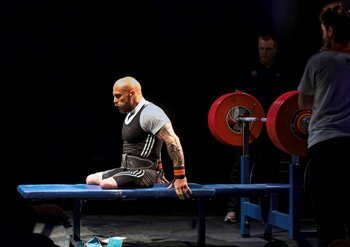 World Champions and Commonwealth Games winners come to Middlesex on Sunday 7 December for the UK Para-Powerlifting Open. The best para-weightlifters in the UK are heading to Middlesex on Sunday 7 December, to take part in the UK Para-Powerlifting Open competition. International athletes from Great Britain will compete alongside club and novice lifters in what is the UK's leading disability bench press competition, as they continue their journey to qualify for the Rio 2016 Paralympic Games. British Weight Lifting (BWL) chose Middlesex as the host for the UK Para-Powerlifting Open because of previous successful sporting events held on campus, but for students it presents a great opportunity to gain valuable work experience. "We're experienced in hosting large sporting events at Middlesex," says Stella Sipple, Middlesex University Deputy Head of Sport and Recreation. "Holding high profile events like this not only raises the University's profile in sports, but it also offers lots of opportunities for Middlesex students and staff." BSc Strength and Conditioning and BSc Sport and Exercise Rehabilitation undergraduates get to work at a number of major sporting events like the London Marathon throughout their degrees, and the Para-Powerlifting Open will be no different. A number of students will be on hand to provide physiotherapy and rehabilitation support at the event, putting their knowledge to practical use and further developing their experience working with elite athletes. The Middlesex University Weightlifting Club will also assist at the event as loaders for the disabled powerlifters. High profile para-powerlifters Ali Jawad, a world record holder and the 2014 World Champion Commonwealth Games bronze medallist, as well as Invictus Games 2014 gold medallist Micky Yule and Commonwealth Games 2014 silver medallist Natalie Blake will be among those competing on Sunday. The UK Para-Powerlifting Open runs from 10am to 2pm on Sunday 7 December in the Rickett Quadrangle at Middlesex University, Hendon. Entry for spectators is free.